While most of the recent furor about the Chicago Police Department (CPD) has focused on allegations of excessive force, there have also been concerns about the accountability of officers who engaged in potentially unjustified uses of force. The accountability issue is front and center today after the announcement by Attorney General Loretta Lynch that the Department of Justice (DOJ) is launching an investigation of the CPD, including looking at accountability, and the news last night that the head of the Independent Police Review Authority (IPRA), Scott Ando, had abruptly resigned. The IPRA is responsible for reviewing all allegations of misconduct by Chicago police officers. The Chicago Tribune reported yesterday that of the 409 cases of officer-involved shootings reviewed in its nine year history, IPRA found 407 to be justified, and cleared the officer of wrongdoing. That works out to a clearance rate of 99.5 percent. Such a high rate would seem to be statistically improbable. So how does Chicago’s experience stack up against other police departments? The DOJ also investigated the Las Vegas Metropolitan Police Department, and the Department there subsequently implemented many of the recommendation that stemmed from the investigation. The investigation was initiated in large part as a response to a series of investigative articles by the Las Vegas Review-Journal that documented the problems there, much as we are seeing new information come to light in Chicago from a variety of media investigations. Clearance rates in other places, while still high, were much lower than in Chicago. The Miami Police Department was also subjected to a DOJ investigation, which found that 87 percent of police shootings were cleared. In Palm Beach County, Florida, 90 percent of officer-involved shootings were cleared over a 15 year period. Only one other police department had numbers similar to Chicago. The Newark, New Jersey police department was investigated by the DOJ beginning in 2011, after a request was made by the ACLU. In its petition calling for the investigation, the ACLU notes that in 2008 and 2009 there were 128 excessive force complaints made against Newark police officers. 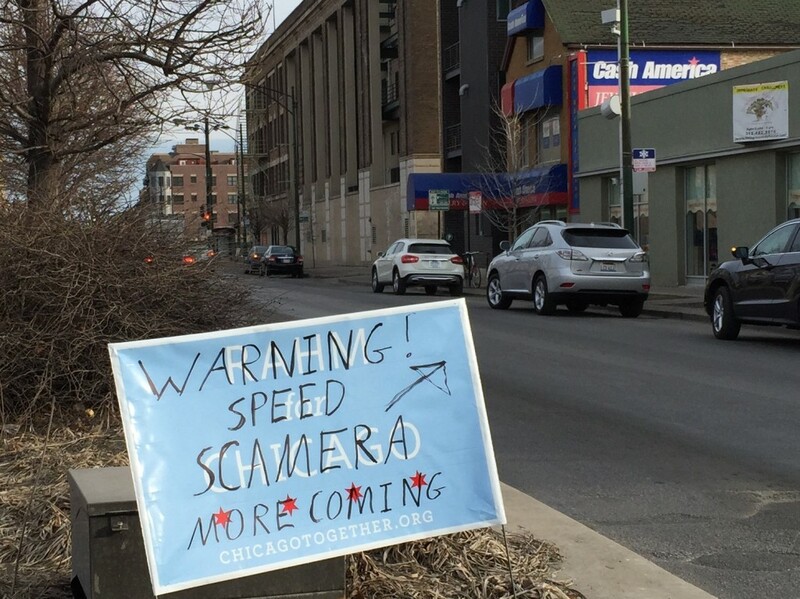 Not a single complaint was sustained – 100 percent were cleared, even better than Chicago’s 99.5 percent. An interesting trivia fact: the police chief in Newark at the time was Garry McCarthy, who was just fired by Mayor Emanuel from his Superintendent position here in Chicago because of similar problems. Politico criticizes Chicago Public Schools (CPS) for failing to make progress in Here’s why $7 billion didn’t help America’s worst schools, which examines the outcomes of the stimulus-funded School Improvement Grants program. In a comparison of outcomes in Miami and Chicago, Miami schools showed improvements under the program while Chicago schools stayed the same or even declined on some measures. The article cites the instability and turnover of CPS leadership, lack of upfront planning as well as buy-in from teachers and other stakeholders, and funding problems. Miami, on the other hand, is praised for strong and continued leadership, even through transitions. The district also partnered with the teachers’ union, and engaged and empowered the participating teachers. If leadership was key to Miami’s readiness, the revolving door at Chicago Public Schools has been that district’s undoing. Six different interim and permanent leaders have occupied the top office since Arne Duncan left in 2009 when Obama asked him to come to Washington. One of them, Barbara Byrd-Bennett, pleaded guilty in October to wire fraud for steering multimillion-dollar no-bid contracts to a former employer. Principals and administrators were “secretive” about the grant process, Meegan said. Unlike teachers in Miami, teachers in Chicago didn’t feel involved and felt that they were losing control over their classrooms as the emphasis shifted to testing. Liz Dozier, the former principal at Fenger High School, which participated in the program, noted the lack of stable, long-term funding and the challenges of poverty and violence. Mayor Rahm Emanuel watches Jorge Soler bat in the 5th inning. 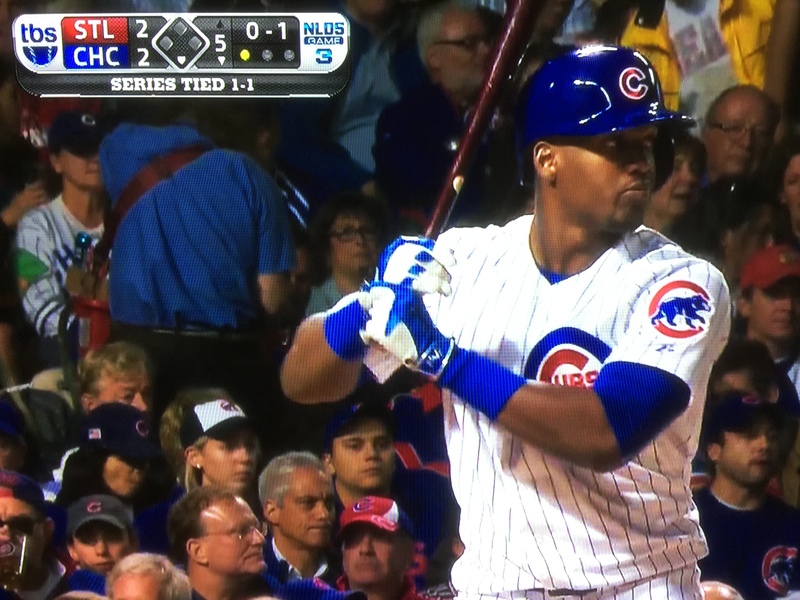 Just about every time a right-handed hitter stepped up to the plate during Monday night’s Cubs playoff game against the St. Louis Cardinals, television viewers were treated to the sight of Mayor Rahm Emanuel sitting a few rows back in the crowd near the Cubs dugout. Turns out his attendance at the game was no coincidence. [Cubs Spokesman Julian] Green said he saw nothing wrong with the offer. The elected officials didn’t need to register for a lottery, and they certainly didn’t get the same email I did. Of course, had I been willing I could have bought a scalped ticket for some exorbitant amount of money. Fortunately for our elected officials, they didn’t need to resort to that, since they were offered their tickets at face value. Unfortunately for them, the Chicago Governmental Ethics Ordinance defines any thing of value given without fair market value consideration as a gift. Paying face value is not the same as paying fair market value. A review of eBay ticket transactions for Monday’s game shows that comparable tickets generally sold for $250 – $350 per ticket. These prices should be considered the fair market value for these tickets. The difference between that and the face value of $64 – 74 paid by the elected officials is at least $176 per ticket, and each official was offered two tickets. It appears that this amount should be considered a gift, and under the Ethics ordinance, gifts to elected officials of more than $50 in one year are prohibited. In other words, the elected officials were barred from accepting these tickets unless they paid fair market value for them. Since some officials might find this confusing, the Board of Ethics provides them with guidance about gifts. Again, note that the Board of Ethics says to pay fair market value, which was not done in this case. 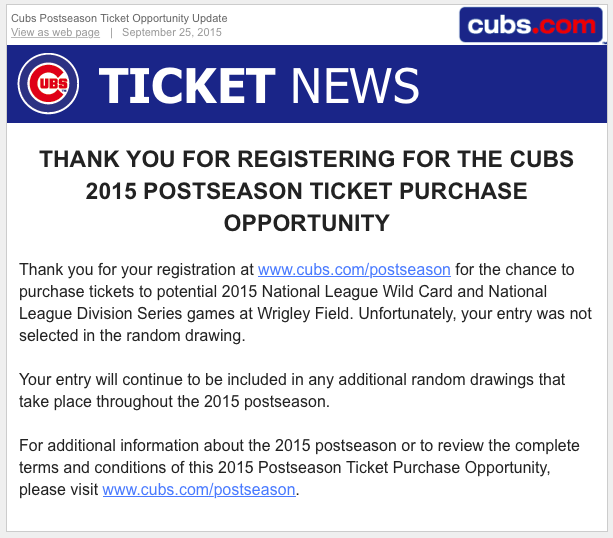 This is not the first time baseball playoff tickets have figured in a local ethics scandal. In 1993, four employees of the Illinois Commerce Commission (ICC), which regulates utility companies, attended a White Sox American League Championship Series (ALCS) game against the Toronto Blue Jays with tickets they purchased from Commonwealth Edison. ComEd Vice President Donald Petkus told the Tribune’s John Kass at the time that he “arranged for the ICC staff to buy the $40 tickets at face value” and that “he did not consider the ticket arrangement an ethical violation because the company did not give the tickets as an outright gift.” Sound familiar? “Scalpers were getting far more than face value on the street outside the ballpark,” Kass noted. The ICC immediately launched an investigation, with a spokesperson noting that the incident “does raise the appearance of impropriety.” The four staff members were quickly reassigned and reprimanded. Someone needs to investigate whether these ticket purchases violated the law. It’s too bad the ethical oversight of the City Council is such a mess, with Legislative Inspector General Faisal Khan on his way out, and no clarity about what (if anything) comes next. Discussions about authorizing City Inspector General Joe Ferguson to investigate the City Council have not produced any action. At least Ferguson has existing jurisdiction regarding the Mayor. And in case you were wondering, in 1993 the Blue Jays beat the White Sox in the ALCS and went on to win the World Series over the Philadelphia Phillies. Patrick Thompson, who is currently serving as a Metropolitan Water Reclamation District (MWRD) Commissioner, was elected yesterday as the next 11th Ward Alderman. This will create a vacancy on the MWRD board when Thompson steps down, which he is planning to do prior to being sworn in as alderman next month, according to his campaign manager Mark Walsh. Under State law, Governor Bruce Rauner will appoint someone to fill the vacancy. Thompson was elected in 2012 to a six-year term, so his replacement will serve until the 2016 election, when voters will get to choose who serves the final two years of the term. Rauner became embroiled in the controversy surrounding the selection of a new State Comptroller when Judy Baar Topinka died in December, shortly after being reelected. Rauner, then Governor-elect, called on Gov. Quinn to appoint Topinka’s aide Nancy Kimme to fill the temporary vacancy until the end of the term in January. Topinka was a Republican, as is Rauner, and Quinn a Democrat, turning the selection into a partisan fight. Quinn chose to appoint Jerry Stermer, his budget director and a Democrat, and Rauner then appointed Leslie Munger, a Republican, to fill the vacancy until a special election is held next year for the remainder of the new term. Confused yet? Rauner will have to decide whether to replace Democrat Thompson with another Democrat, or he could appoint a Republican. It has been decades since a Republican was elected to the MWRD board, which is elected county-wide. Also, after publicly advising Quinn on the Topinka vacancy, it will be interesting to see whether he is willing to accept recommendations for this seat, or will just pick someone. Walsh said that he doesn’t know if Thompson plans to recommend a replacement to Rauner. Appointed commissioners have had mixed success in the past. Republican Jim Edgar filled two vacancies, appointing James “Tod” Miles in 1996 and Susan Kelsey in 1997. Both were Republicans, filling spots vacated by Democrats, and both were soundly defeated when they tried to hold their seats in the 1998 election. Republican George Ryan took a different path when he appointed Democrat Martin Sandoval in 1999. Sandoval won the election in 2000 to finish out the term, and then moved to the State Senate in 2002, where he continues to serve today. Most recently, Pat Quinn appointed Mariyana Spyropoulos to a vacancy in 2009. She had run for a seat in 2008, finishing fourth in the Democratic primary where the top three candidates were nominated and then won in the general election. Spyropoulos then ran and won in 2010, and earlier this year was selected by the board members to serve as president. The history lesson here appears to be that appointing a Republican will just keep the seat warm for two years, while appointing a Democrat may launch a newcomer’s political career. We’ll have to wait and see how Rauner chooses to play his cards, and how much drama he wishes to create with his pick. 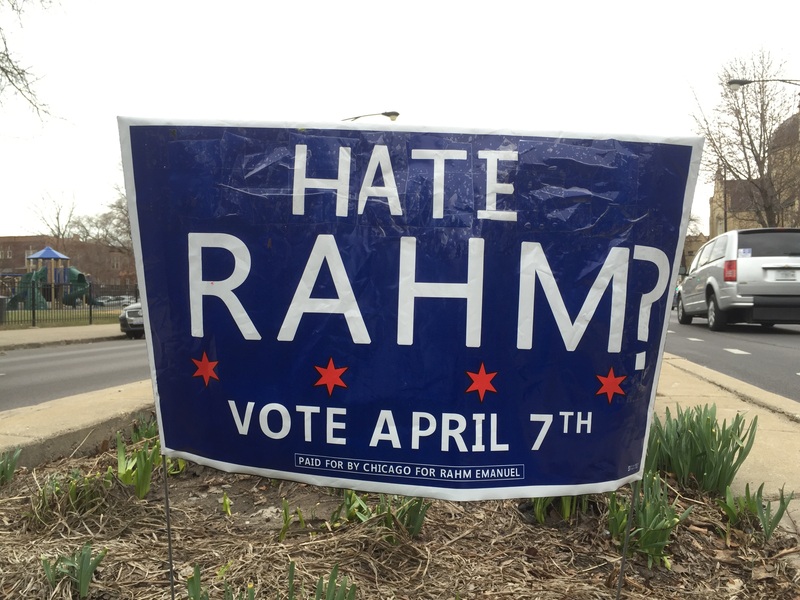 On my morning commute today I was treated to a veritable art installation of repurposed Rahm Emanuel campaign signs in the median of N. Ashland Avenue, spread over about 10 blocks. 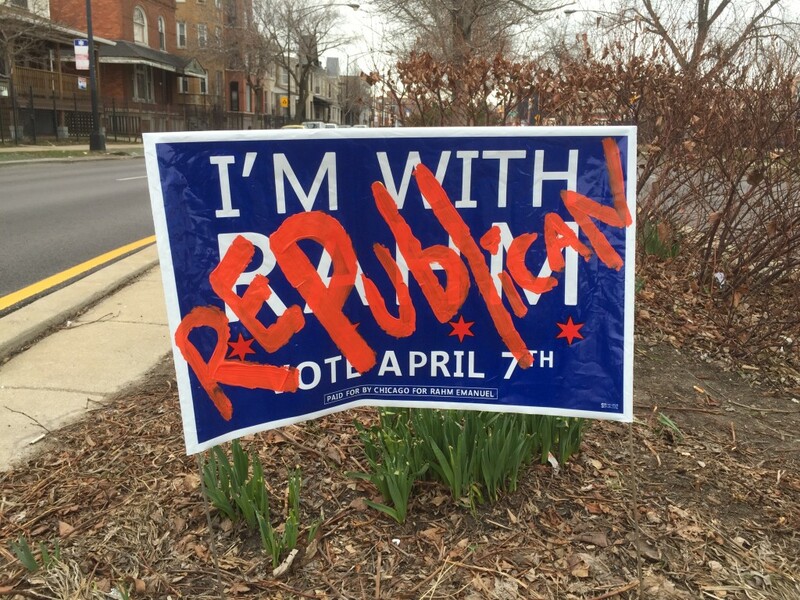 If these don’t tickle your fancy, DNAinfo has a nice piece about homemade campaign signs. When Mayor Emanuel announced his original education team in 2011, the press release very carefully noted those board and senior staff members who were also Chicago Public Schools (CPS) parents. Three of the board members had children at a CPS school – Board President David Vitale, Rodrigo Sierra, and Andrea Zopp. Beth Swanson, the Mayor’s Deputy Chief of Staff for Education, was also a CPS parent. Sierra served only 18 months before moving to the Chicago Housing Authority board. Based on public information sources and social media profiles, it appears that all of the Vitale and Zopp children have graduated and are no longer CPS students. Beth Swanson, the only senior staff person to have children in CPS, has also moved on, leaving the Mayor’s Office last summer for a position with the Joyce Foundation. Also based on public and social media sources, it appears that only two of the board members have school-age children, and they attend private schools. Deborah Quazzo’s son attends Latin School of Chicago, as did her two older children, and her husband serves on the Latin School Board of Trustees. Board Vice President Jesse Ruiz’s two children attend the University of Chicago Laboratory Schools. Lab School has multiple ties to CPS and political leaders. Mayor Emanuel’s three children go to school there, as did President Obama’s daughters, and former CPS board member and current U.S. Commerce Secretary Penny Pritzker’s children. Instead, the question is whether the board members are representative of the people they are serving. Do they have shared experiences with the families whose lives are being impacted by their decisions? This is a fundamental value in our system of democracy. At the Chicago Housing Authority (CHA), the mayor is required by State law to appoint CHA residents to three of the ten board seats. Additionally, the CHA residents are part of an advisory council that proposes a list of potential board members to the mayor. Chicago Transit Authority (CTA) board members have been scrutinized as to how often they ride the CTA. 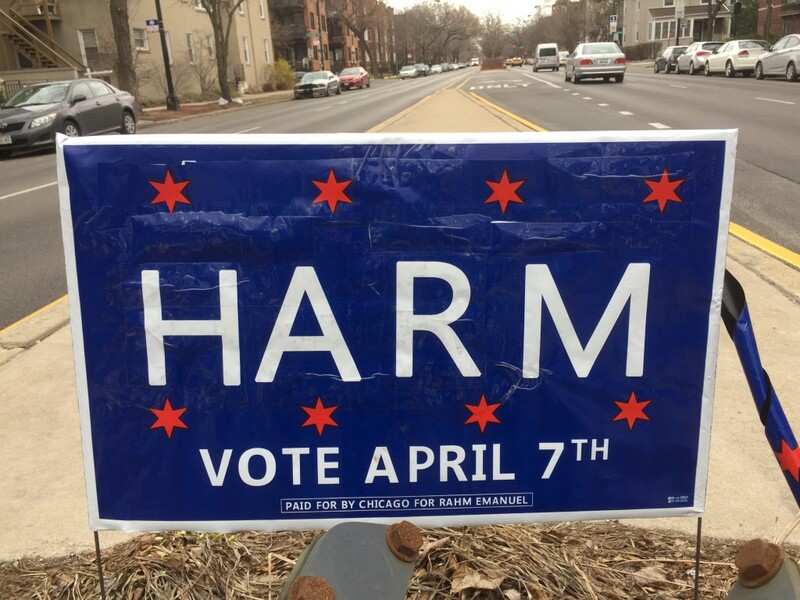 This issue may be one of the reasons why there is such a strong push for an elected school board in Chicago, and why about 90 percent of voters support it. Mayor Emanuel’s response is that there is more accountability with the current system of an appointed board, because it all rests on his shoulders. That’s a fair point, and we’ll find out on Tuesday how the voters feel about his education record. The CPS Communications office did not respond to a request for comment. Rahm Emanuel is the preferred candidate of 65% of Illinois’ billionaires, according to campaign finance records. Of the 20 billionaires in Illinois, 13 have donated more than $2.3 million in support of Emanuel during the past 4 1/2 years. 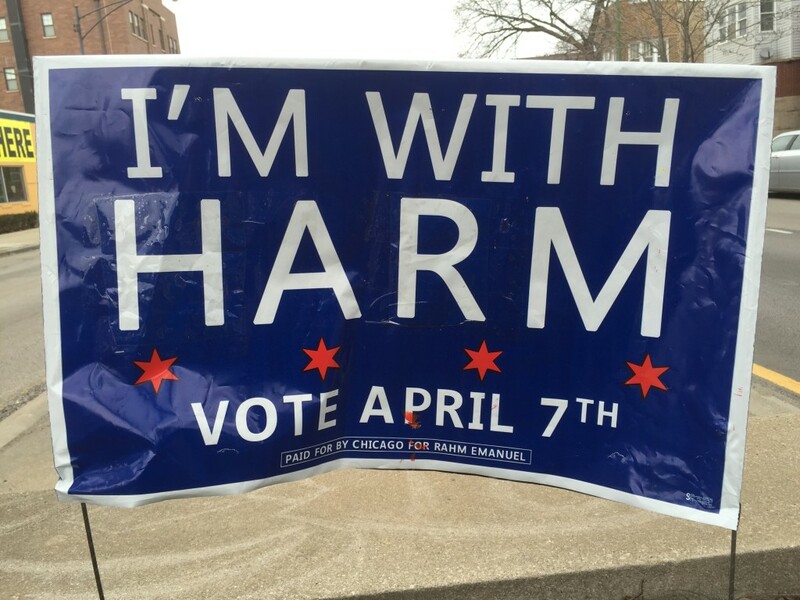 Rahm Emanuel’s campaign fund Chicago for Rahm received $1,214,632 from the 13 billionaires, while another $1,150,000 was donated to Chicago Forward, a political action committee supporting Emanuel. On average, each of these billionaire donors gave nearly $182,000 to Emanuel. 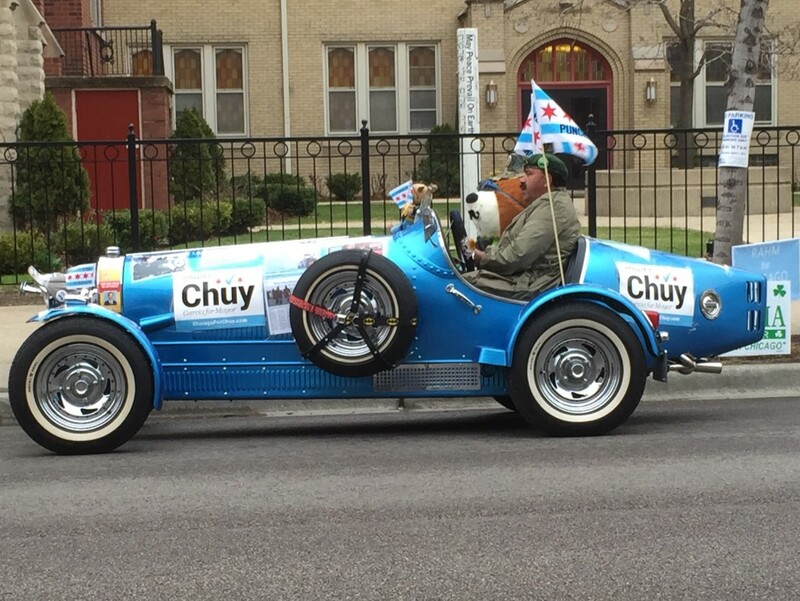 None of the 20 billionaires have donated to Chuy Garcia’s campaign. Earlier this month Forbes released its annual list of the world’s billionaires. There are now 1,826 billionaires worldwide, with a total of 536 in the United States. Forbes lists 18 billionaires from Illinois. Two Illinoisans, brothers Christopher and Jude Reyes, were considered by Forbes to have moved to Florida, but they are continuing to list Illinois as their residence for campaign finance disclosures, so they are included here, bringing the list to a total of 20 billionaires. They range from Ken Griffin, CEO of Citadel Investment Group (#216 worldwide with a net worth of $6.5 billion), to the state’s newest billionaire Jerry Reinsdorf, owner of the Chicago Bulls and Chicago White Sox (#1415, net worth $1.3 billion). Ken Griffin is Illinois’ richest person and is also Rahm Emanuel’s largest donor. 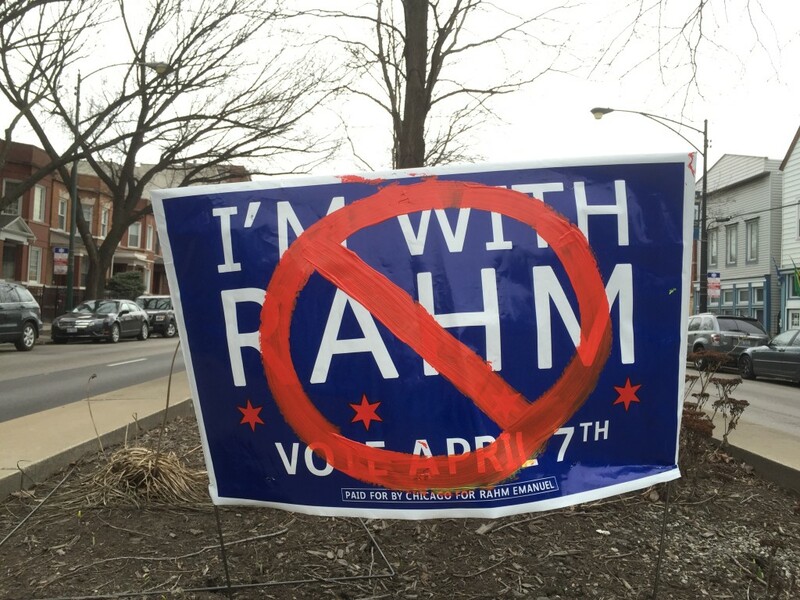 The hedge fund owner has given $430,300 to Chicago for Rahm and $850,000 to Chicago Forward for a total of $1,280,300. Griffin is a prolific political donor, primarily to Republican candidates. He has given more than $13 million to Gov. Bruce Rauner’s campaign fund, making him also Rauner’s largest donor, outside of Rauner himself. While Emanuel is the overwhelming favorite of the billionaires, there is one group that has been stingier with their political pocketbooks: the members of the Pritzker family. Six Pritzkers are on the list of billionaires, but only two of them have contributed to Emanuel. Jay Robert (J.B.) Pritzker has given a total of $157,000 to Chicago for Rahm, while Nicholas Pritzker has given $33,332. Gigi, Jennifer, Penny and Thomas Pritzker have not donated to Emanuel. Penny Pritzker currently serves as U.S. Commerce Secretary and was appointed by Emanuel to the Chicago Board of Education, while her husband, Bryan Traubert, is the President of the Chicago Park District Board of Commissioners. So 79 percent of non-Pritzker billionaires have financially supported Emanuel, compared to only 33 percent of the Pritzker billionaires. Note: All contribution data is through March 31, 2015. 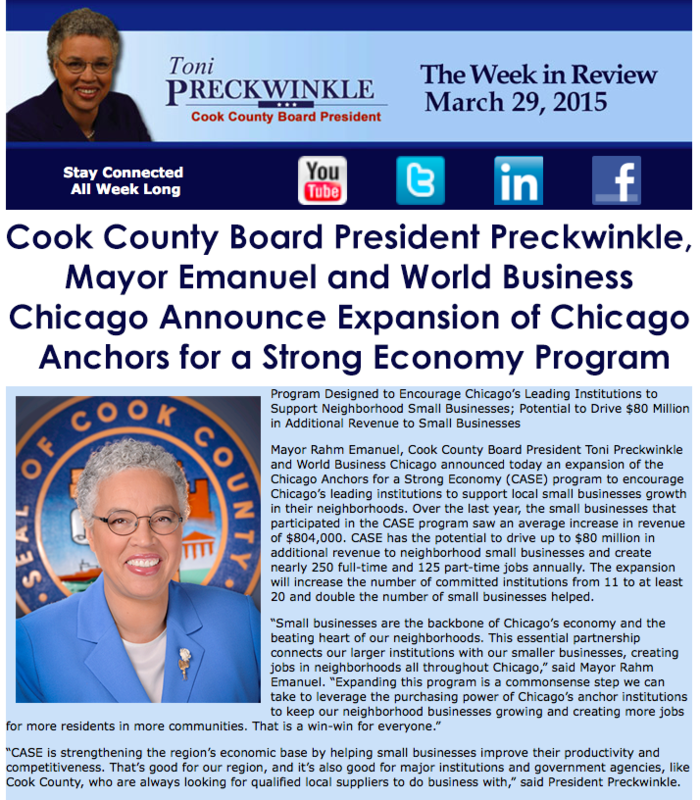 Cook County Board President Toni Preckwinkle sends out an email newsletter every Sunday morning. With a little more than a week to go before the mayoral election, it was striking to see the lead article today highlighting Mayor Rahm Emanuel, based on a 10 day old press release. Preckwinkle has stated that she is remaining neutral in the mayor’s race, although rumors have swirled that she was still considering endorsing Garcia, who serves as her floor leader on the County Board. There is even an online petition urging Preckwinkle to endorse Garcia. 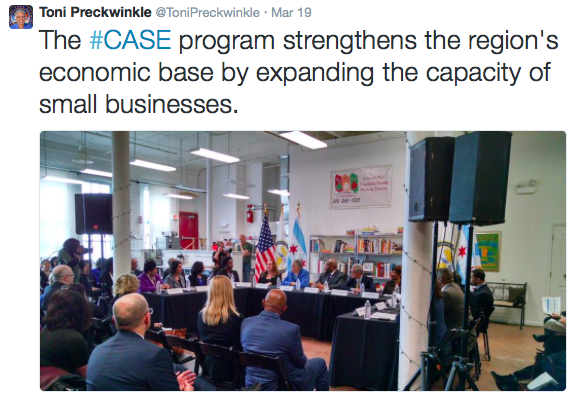 The press release, which was put out on March 19, announced an expansion of the Chicago Anchors for a Strong Economy (CASE), and touted the roles of Emanuel, Preckwinkle and World Business Chicago. The release was issued jointly by the City of Chicago, Cook County, and World Business Chicago. The full release is available here, and below is a copy of the newsletter article.